The John E. Jaqua Law Library provides 20 rooms to be used for collaboration, study and research sessions by law students and faculty. Room keys may be checked out at the Checkout/Reserves/Information desk. Study rooms are available on a first come, first served basis to currently enrolled UO JD, CRES, and LLM students. Rooms are renewable subject to availability. The Library is not responsible for personal items left in the rooms. Please do not leave your belongings unattended in study spaces. Law faculty may reserve rooms for instructional use. Please direct booking requests to Angus Nesbit at 346-1673. 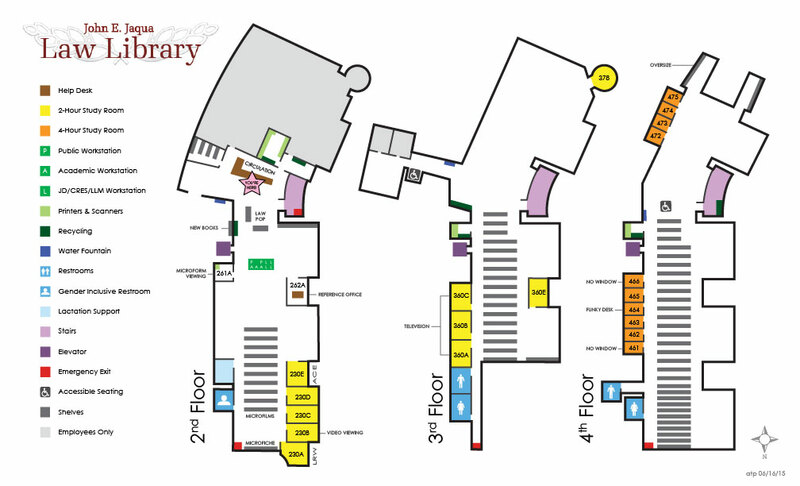 Large group study rooms on the 2nd and 3rd floors of the Law Library may be checked out by currently enrolled UO JD, CRES, and LLM students for 2 hours. Rooms are renewable subject to availability. Individual study rooms on the 4th floor may be checked out by currently enrolled UO JD, CRES, and LLM students for 4 hours. Rooms are renewable subject to availability. Study rooms 230C, 230D, 230E each offer a whiteboard and iMac with 27" monitor and DVD drive. In addition to the standard equipment study room 230B also offers a VHS player. Study rooms 360A, 360B, and 360C each offer a whiteboard and iMac with 27" monitor and mounted 46" TV monitors with access to the UO cable channels. Study room fines accrue at $3.00 for any part of the first hour overdue, and for any part of each hour after the first, up to a $40 maximum. Lost key charge is $70. For more information about our study room policies, please contact the Checkout Desk at 346-3088.